Public administration is a craft that demands real-world application of concepts and theories often learned in a classroom. Yet many students find it difficult to make the leap from theory to practice completely unaided. The Public Administration Workbook, 8e is specifically designed with the theoretically-grounded, practice-minded student in mind. It reviews scholarship in political science, law, industrial psychology, and the sociology of organizations and then allows students to see how these intellectual fields inform the analytical and managerial tasks that comprise public administration. 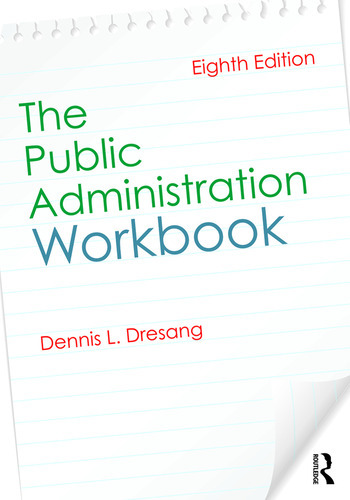 Where standard public administration textbooks examine the nature of public agencies and explain how bureaucracies relate to other institutions, this workbook promotes a more effective way of learning—by doing—and more directly prepares those who will pursue careers in public agencies. Each chapter begins with a discussion of relevant concepts and scholarship before moving into a hands-on exercise analyzing core analytical and management challenges. This edition includes an all-new exercise on contract negotiation, many international examples interwoven throughout the book, and a fully updated HRM section to reflect alternative ranking and compensation systems. Each chapter is further supported by a detailed Instructor’s Manual written by the author to guide instructors on solutions, explanations, and ideas for using or modifying the exercises to fit a variety of course needs, as well as downloadable datasets and exercises, providing students with a unique opportunity to apply and test classroom concepts outside of the job. Dennis Dresang is Professor Emeritus of Public Affairs and Political Science at the University of Wisconsin-Madison, USA.